One of the aims of the Geological Map Project was to provide an introduction to the geology of Yorkshire. The mosaic map introduces many ideas, particularly Smith’s message about how the rocks had been laid down in strata which could be identified by the fossils they contain. 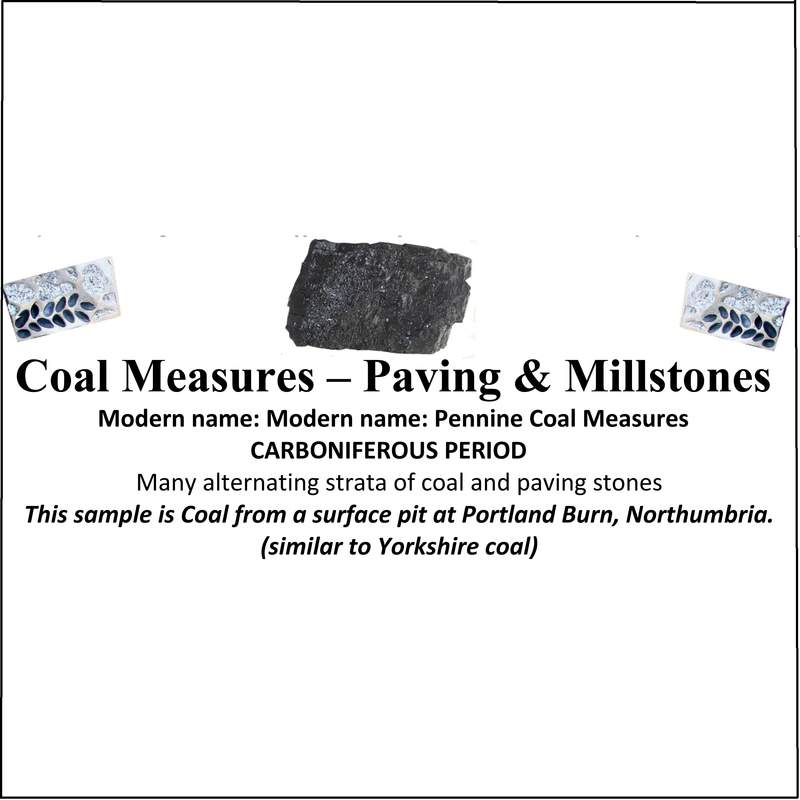 However, necessarily, the pebbles in the mosaic were chosen to reflect the colours Smith used in his map, not the appearance of the actual rocks.To demonstrate what the real Yorkshire rocks look like, we have collected samples of rock from sites identified by Smith throughout the county. These are now displayed in the flower beds on either side of the mosaic, illustrating the strata in order of deposition . It was not easy to decide on suitable representative specimens. As Smith was working alone, and often had to deduce structures that were hidden under superficial deposits, his map was not always totally consistent with modern knowledge. Smith recognised these limitations, and continued to make improvements to the work. This was continued by many later geologists, who have also changed the names of rock types many times. We eventually decided to choose a specimen from each geological area shown in the 1815 map, even where Smiths 1815 name did not exactly match modern interpretations. To compound the problem, large specimens of coal and clunch clay are not now readily obtainable in the exact areas shown by Smith, so specimens from geologically similar formations were obtained from elsewhere. In North Yorkshire, Smiths clunch clay and shale corresponds mainly to Redcar mudstone from the lower Jurassic lias. Most of the Redcar mudstone is friable shale, so we have selected a particularly hard siliceous stratum that will better resist weathering. Confusingly, Smith has used the term clunch clay in other parts of the country to describe Oxford clay from the upper Jurassic. Collecting the specimens presented more problems, but with the advice of many geologists and and the help of Geoff Hutchinson of the YMT, a number of quarry managers, and a several YPS members, we now have a complete set. Samples from areas described by Smith as ‘Red Marl’ and ‘clay with sand and gravel’ have presented other problems, as untreated specimens would have weathered rapidly. “Potter Man”, Lee Steele, has been able to treat and fire these samples in a creative way, but although he has used a clear glaze, the colour of the clay has, of course, changed in firing. which also allows you to change base map and flip between the WS 1815 map and a modern geological map. .